Meta has just had a party to celebrate 18 years as a company. We are confirmed believers in celebrating and would encourage you to look at what you can celebrate. It gives everyone a boost in morale, and it reminds us to pay attention to our successes and progress, rather than just focussing on what hasn’t worked or has gone wrong. Celebrating doesn’t have to be a party. It can just be a cup of tea and a bun for the team at the end of a tough week, to celebrate getting through the toughness. It could be telling everyone to go home half an hour early because you’ve hit a target that week. 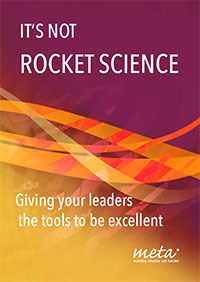 It really works well as an agenda item for meetings, where each person says something they’re pleased with or proud of. This reminds people that progress is being made, and also helps to make sure that the team stay aware of what each other is doing. 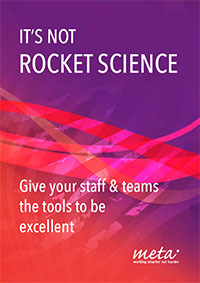 As well as celebrating progress with the work, you can also celebrate the way your team behaves. I know of teams who nominate a team member each month to have the ‘trophy’ for the person who has best demonstrated the values of that team. This is a great way to recognise that how we behave contributes to our success as much as what we get done. We all respond to recognition positively. It’s a great motivator. And it doesn’t have to involve great fanfares. Just knowing that someone has noticed that I did a good job, that I handled something well, that I behaved in a way that was helpful and constructive, encourages me to do more of the same. And it contributes positively to the team spirit, helping us through the more difficult bits. Work can sometimes seem like a hard slog, with just the ‘lowlights’ being paid attention to: when things go wrong, when someone messes up. Let’s balance that by noticing the ‘highlights’ as well, and remind ourselves that, on the whole, we do a pretty good job! Jo Clarkson is the CEO of Meta and a frequent writer of the Meta-Org.com blog. THE RIPPLE EFFECT – WILL YOU BE A POSITIVE OR NEGATIVE RIPPLE TODAY? 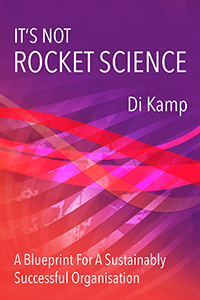 Di Kamp's new book is available for Kindle on Amazon. © 2012 Meta Org. All Rights Reserved.